In an argument between economics and thermodynamics, thermodynamics wins. June 2000: An Empirical Perspective on the Energy Payback Time for Photovoltaic Modules [text: technical paper, pdf 54 kb -- graphics: slide show, pdf 222 kb] demonstrates that payback for production PV modules ranges from 2-3 years and energy output varies between 9-17 times the input. By Karl E. Knapp, Energy & Environmental Economics, Inc., and Theresa L. Jester, Siemens Solar Industries, presented at the American Solar Energy Society Annual Meeting in Madison, Wisconsin. Read as an article in pdf format from Home Power Magazine, Dec 2000/Jan 2001. 1999: ASE Americas claims "it takes 8 to 16 months of PV operation to replace the energy consumed in making an ASE module. 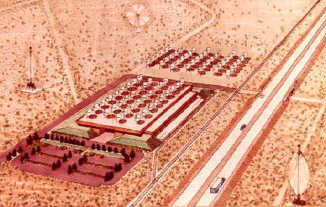 ASE Americas' EFG process uses about 1/2 the silicon, 1/3 the energy, and 1/3 the hazardous waste to produce a wafer as conventional solar cell techniques." 1997: At a conference on the Environmental Aspects of PV Power Systems, it was reported that the Energy PayBack Time ("EPTB") of frameless thin film modules is below 2 years for present-day technology. (A frame adds up to 1.6 years to the EPTB). The study further states that in the future an EPTB of less than 1 year is feasible for frameless thin film modules. 1997: A summary of numerous studies, "Can Solar Cells Ever Recapture the Energy Invested in their Manufacture?" was presented in Solar Progress, Australia and New Zealand Solar Energy Society. 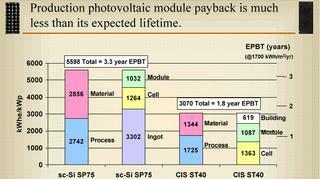 1991 and 1992: Several studies for amorphous solar cells reported energy payback estimates of 1.3 to 3 years. Considering that solar panels typically have useful lives of 20 years or more, the electric energy recovery will range from 400% (in the case of a 5 year energy payback) to 2000% (in the case of a 1 year energy payback). These figures demonstrate that a barrel of oil [equivalent] invested in making solar panels can effectively generate sufficient electricity to recover the investment of that barrel of oil with 4 barrels of oil [equivalent] as a minimum and up to 20 barrels of oil in the optimistic scenario. This is like investing in a savings account at an interest rate ranging from 20% to 100%. At the low end, this is a healthy return on investment! Crystalline flat plate photovoltaic panels do not fare quite as well as thin-film panels in terms of energy payback time ("EPBT"). For example, at the above-mentioned 1997 conference, system EPBT values ranging from 5 to 10 years were reported for present-day mono-crystalline silicon modules. While this analysis is more pessimistic than some of the other studies cited, this helps to explain why photovoltaic systems have not been as attractive as other energy investments and thus have been limited to remote applications where transportation of other energy resources (such as combustible fuels) is expensive. As technology improves, energy performance improves. For example, concentrator systems perform better than crystalline wafer flat plate panels, yielding energy paybacks on the order of 1.5 - 3 years (depending on the specific technology). [This information is based on interviews with professionals in the field. Citations from the scientific literature are being researched.] As energy payback time improves, photovoltaics will achieve economic payback in the general electricity marketplace. For another example, read about more energy-efficient "PV Grade" or "Electronic Grade" Green Silicon. While economic payback does not correlate exactly to energy payback, and may not reach the same remarkable level of three years, these figures demonstrate why prices have been falling and how the underlying fundamentals of electricity produced from solar cells can lead to wise investment. How does EPBT for PV stack up against fossil fuels? It might be surprising to discover that the energy payback for oil has been declining steadily for many decades. See figure 2.15 in Beyond Oil, Gevers et al, 1991]. As the energy payback improves for PV and declines for oil, the attractiveness of PV will only continue to get better.